Camp Ukiki is a Duel minigame in Mario Party 7. 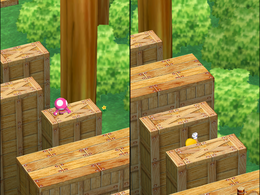 The mini-game is a race to the end of an obstacle course. The first obstacles are a lot of tall stakes that form a maze. Then the players must jump from platform to platform as they continue. Then they automatically take a zip-line to the next area. Then they must go through more platforms or try to go up some short ramps. Players who fall off are taken back to the last gate they were at. The time limit is five minutes, but the timer is not visible until 30 seconds remain. Should the time expire, the game ends in a tie. Rules – "Race against your foe as you make your way through the obstacle course." Advice – "Move quickly, but don't get out of control. If you fall, you'll lose valuable time." This page was last edited on January 1, 2018, at 01:53.